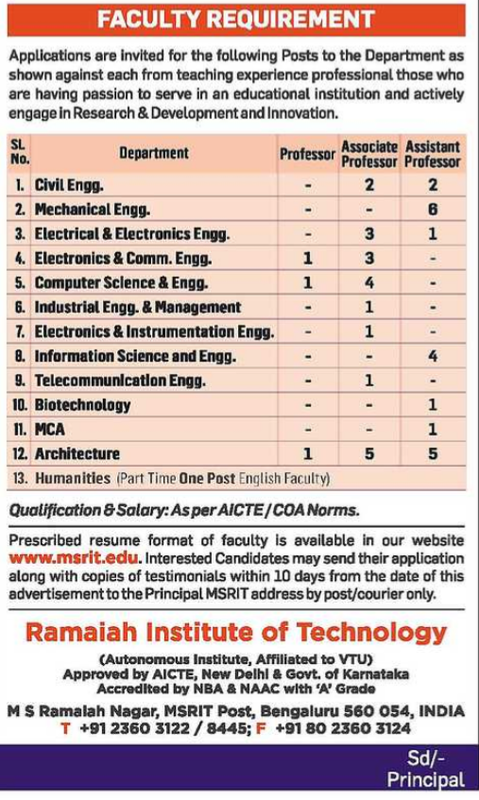 Ramaiah Institute of Technology, Bengaluru has advertised in HINDU newspaper for recruitment of professor, Associate, Assistant Professor vacancies. Interested and eligible job aspirants are requested to apply with in 10 days.Check out further more details below. About College: We at M. S. Ramaiah Institute of Technology, Bangalore strive to deliver comprehensive, continually enhanced, global quality technical and management education through an established Quality Management System complemented by the synergistic interaction of the stake holders concerned. 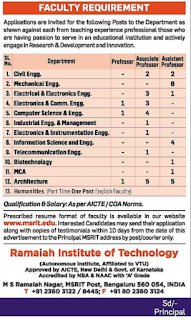 How to Apply: Interested candidates, prescribed resume format of faculty is available in our website www.msrit.edu. Interested candidates may send their application along with copies of testimonials with in 10 days to the principal. Reference: Advertisement on Hindu newspaper Dated 23rd May 2018.